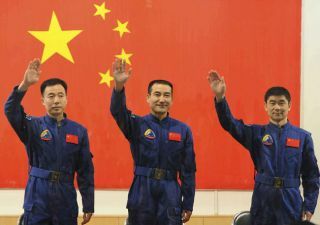 Chinese astronauts, left to right, Jing Haipeng, Zhai Zhigang and Liu Boming wave during a press conference at the Jiuquan Satellite Launch Center in northwest China's Gansu province, on Wednesday September 24, 2008. Photo distributed by the official Xinhua news agency. China is set to launch its third manned mission into space Thursday. Three Chinese astronauts are slated to liftoff from Jiuquan Satellite Launch Center in northwest Gansu province between 9:07 a.m. and 10:27 a.m. ET(1307 and 1427 GMT) Thursday, according to state news agency Xinhua. The historic Shenzhou7 mission is set to include the nation's first spacewalk. "We have confidence, determination and ability to makethe nation's first step in outer space," said Jing Haipeng, one of thethree Shenzhou 7 crewmembers, at a press conference on Wednesday, thestate-owned Xinhua news service reported. Jing is set to join fellow Chinese Air Force fighter pilotsLiu Boming and Zhai Zhigang, all age 42, as China's first three-membercrew to fly to space. China has not officially named the astronaut who willcarry out the planned 40-minute spacewalk, but some reports predict it will beZhai. "The Shenzhou 7 mission marks a historic breakthrough in China's manned space program," Zhai said Wednesday, Xinhuareported. "It is a great honor for all three of us to fly the mission, andwe are fully prepared for the challenge." The mission is due to last five days, and land in Inner Mongolia on Sept. 28, if the launch occurs Thursday as planned. During the spacewalk, one astronaut is set to step outsideof the spacecraft, while another will assist from inside. Both crewmembers areto wear spacesuits, though one of the suits will be a new, Chinese-made suit,while the other will wear a Russian-made Orlan spacesuit, the Associated Pressreported. China has reportedly spent 30 million yuan (about $4.4million) creating its Feitan spacesuit, which provides the wearer with apressurized atmosphere, oxygen and temperature control, and communicationability. It also protects astronauts from radiation, micrometeoroids and otherharmful particles in space. The spacewalking crewmember is slated to retrieve scientificexperiments placed outside the spacecraft and deploy a small satellite capableof sending images back to Earth. If the launch goes as planned, the spacewalkis likely to occur Friday or Saturday, the Associated Press reported. In a gesture of confidence and openness, China hasannounced plans to broadcast the spacewalk live. The Chinese spacewalkers will be "supported by Russianexperts throughout the mission," the Associated Press quoted Wang Zhaoyao,spokesperson for China's manned space program, as saying. "The successfulcooperation on the Shenzhou 7 manned mission will create favorable conditionsfor future cooperation between our two countries." The Chinese spacecraft itself is based on Russia's Soyuz vehicle, but modernized by Chinese engineers. The Shenzhouspacecraft includes an orbital module, a crew compartment, and a servicemodule that houses propulsion and other vital systems. Only the crew-carryingsection is designed to return to Earth intact. If it is successful, China's first spacewalk will be animportant milestone in establishing the country as a bona fide space power. Itcould also be a stepping stone toward goals such as building an orbiting spacelaboratory and eventually landing on the moon. "This flight takes them one step closer to the secondphase of their program, which is getting a space lab," said JoanJohnson-Freese, an expert on the Chinese space program at the Naval War College in Newport, R. I. "It's very important. Their program is ambitious, butit's incremental and very prudent." The Shenzhou 7 flight follows the successful October 2005launch of China's Shenzhou 6 mission, which took two Chinese astronauts intospace for five days. The nation's first manned spaceflight, the 2003 Shenzhou 5mission, made China the third country ever, after Russia and the United States, to independently launch a person into space. "Every manned mission is very important for theChinese, both their manned efforts and overall space program," said DeanCheng, China analyst with the CNA Corp., an Alexandria, Va.-based think tank. "It's an issue of prestige both in terms of the domestic audience as wellas internationally speaking."